Recently there has been some controversy on TV news programmes and in the press about the possible recommendations of the Independent Commission on Assisted Dying. This seems to be a strange sentence to begin a report on this play, but it does have some relevance. The play is a black comedy, but in fact it is much more a farce. As such it is to be expected that at least the playing of some characters must be OTT. Exodus purports to be an organisation that, as a service, will arrange death for a person wishing to die. Walter Bryce engages Exodus to perform this service for his depressive wife. Vincent is the agent who arrives at the Bryces’ country cottage with the poison to perform the deadly service. Walter is only too keen to have his wife dispatched discretely so he can continue his affair with Angie, his much younger and very attractive secretary. Thereafter the play shows confusion after confusion as all the characters find themselves close to supping a drink which contains the poison. Into the mix comes Withers from the Samaritans, who blunders his way into the proceedings producing mayhem where only confusion reigned. Frank Ditchburn plays Exodus agent whose manner changes from bluff carefulness to nasty blackmail as he realises the real idea behind his visit. Frank’s long experience on the stage comes to the fore as his character clearly shows his lack of true education, with the oft repeated line about his only leaving school at sixteen being almost unnecessary. Frank dominates the stage whenever he appears but his skill is such that he gives the other players room to play their parts effectively. The part of Walter Bryce is the most important one in the play and Ian Reah gives the audience full value for its money with a no hold barred array of histrionics as he ranges from delight with prospect of going to Montego Bay with his lady love, to being terrified at the prospect of death with his wife. Nicola Michelle Airey acts the part of Angie with the confidence of a seasoned performer. Her’s is really the only straight part in the play. With her looks and ability she will be an asset to Cleadon Drama for many years to come. I look forward to seeing her in a much more demanding part. Gillian Crossley always looks on stage as if she is really enjoying playing her part. As Celia Bryce, Walter’s depressive wife, Gillian looks just a little cheerful in the role except of course near the end when her husband’s real affections are exposed. But it’s always a joy to see Gillian playing on the Cleadon stage, whatever her role may be. Withers, the Samaritan, was played by Chris Bradley. That touch of manic enthusiasm which the role demanded, Chris caught exactly right. His attempts to persuade any character away from suicide were some of the finest moments in the play. Well Done. The audience seem to have thoroughly enjoyed the play, responding to the many funny situations, innuendos and wise cracks. Corinne Kilvington has done a great job in directing the piece. I hope we see her many times in the future. The rest of the support staff may feel well pleased with themselves for a sleek production with no apparent mistakes on or off stage. 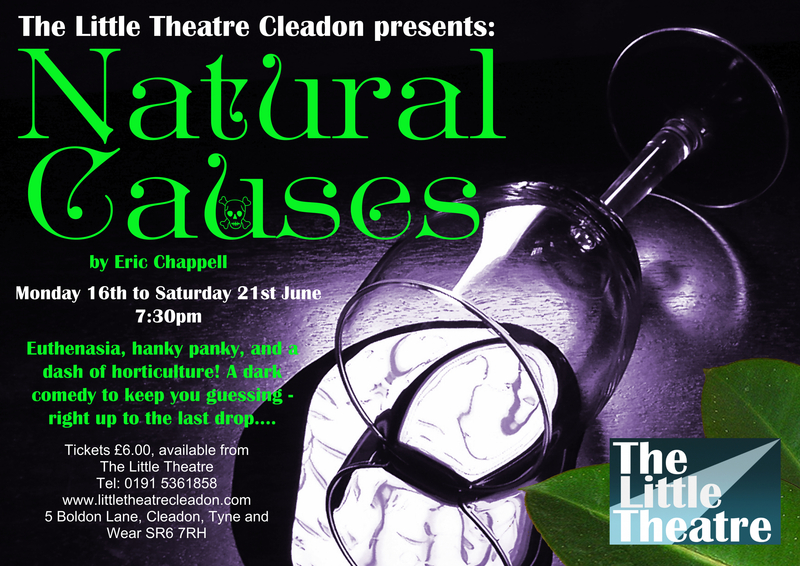 The upcoming June production is Natural Causes by Eric Chappell. A dark comedy acclaimed by the national press at its premier in 1984 as a highly original comedy thriller, full of mistaken identities, hilarious consequences and some great laughs. Nicola Michelle Airey, Chris Bradley, Gill Crossley, Frank Ditchburn and Ian Reah star in our last play of the season directed by Corinne Kilvington.